Water filtration and water softening for well water systems is different. Not that one is better (and yes there are two sides) but it is different. Municipal water sources add chlorine (or chloramines) to treat and dissenfect the water that you drink. Depending on where you live, the chlorine level can be higher than that in a swimming pool. In other locales it is almost non-existent. Well water, however; is different. The water source comes from a well that is tapped into a water table. Sometimes it is at a depth of 60 feet, other times; it can be twice that depth. As a result, there tends to be more sediment found in the water, and; in some cases; more calcium and residue due to natural erosion. What is salt free water softening? We receive a lot of questions that ask, "what is salt free water softening", We also have a lot of customers ask, "will this system filter my water", The short answer to the second question is emphaticaly yes, The Aquios® system is designed to remove chlorine odor and taste, rust, dirt, and other particulate. 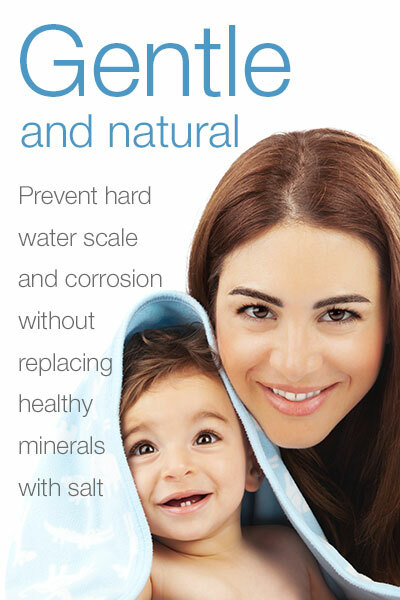 This usually results in water that is not only better tasting, but healthier for your family, Salt free water softening is different than traditional water softening, A key difference is that healthy minerals such as calcium, manganese and iron (which your body needs) are not removed with salt free water softeners.